Sometimes the best desserts are the most simple. 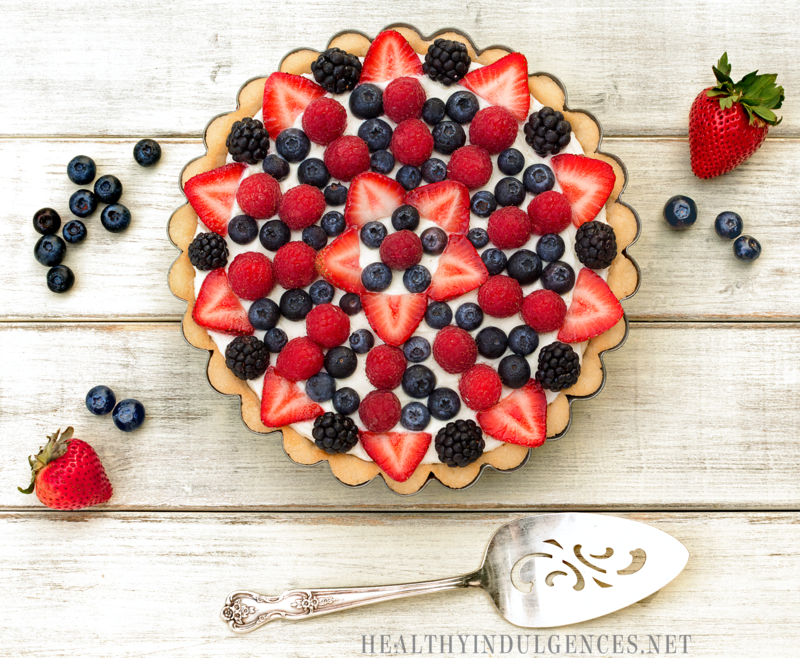 For many of us, the 4th of July involves tending to the barbecue, chasing after the little ones, and squeezing maximum fun out of holiday weekend with the fam in a 48 hour whirlwind trip home, so dessert has to be uncomplicated. At last, I am posting the recipe that goes with the photo you see below! Apologies for the delay. Am enjoying the last days of Spring Break. The Floridian in me is pretty excited about it (hint: it’s a well-loved pie! ), too. Regarding comments, I’m sorry to say I cannot keep up with them for the time being. I am merely a student, with my top priorities being school work and other activities on campus. Please do not hesitate to email me. Go ahead and shoot me another one if I miss your first email! I will be creating a separate email account shortly just to respond to blog comments and questions, since they are currently mixed in with my school/work/personal emails. Thank you for your understanding. 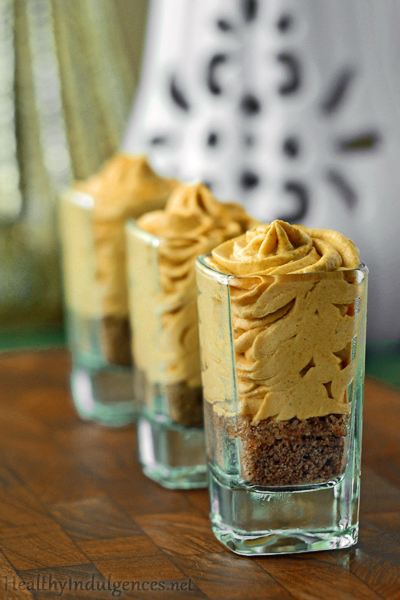 At any rate, I hope you will give these easy, tasty cheesecakes a try. You can add what ever berry you like, or perhaps get creative and drop other goodies into the unbaked filling (low carb chocolate chips? sugar-free cookie chunks?!). The gluten-free nut crust could be tweaked with finely ground dried coconut flakes and perhaps a bit of buckwheat flour to make it nut-free for those allergic, but I will leave the experimentation up to you this time! 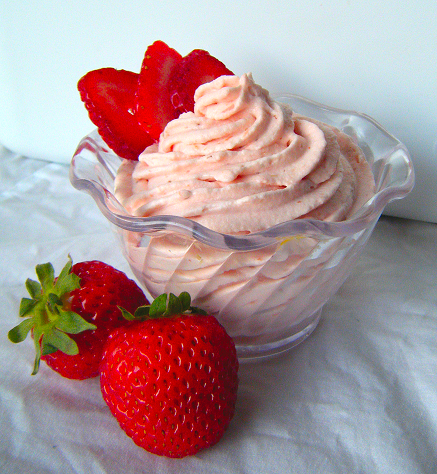 Easy Sugar-Free Strawberry Mousse–a Low Carb Summer Treat! I eat sugar-free because it’s what my body wants. How do I know this? Sugar and carbs were ruining my life. I had no idea why I constantly craved sugar and processed carbs, and my obsession quickly turned into an eating disorder. I had no control over my cravings…my body wanted more and more and I became a slave to it. I’d binge on sugary, carb-loaded foods and then feel horrible about it and go to great lengths to undo my binges (which I will not describe in detail here). I also suffered from wild mood swings, irritability and fatigue, all of which everyone (including my doctors!) attributed to PMDD. But I knew it was more than that. All of the treatments I tried for PMDD symptoms had failed. Eventually, completely exhausted, and my body ravaged from my bingeing cycles, I began to do desperate research into blood sugar and its effects on the body. I was shocked to find out that SO many of the symptoms I suffered from, especially the constant sugar and carb cravings, could be due to extremely unstable blood sugar levels! I immediately stopped eating all sugar and carbs, and have never felt better. I almost never suffer from cravings anymore, I have stopped my destructive bingeing cycles, and am no longer controlled by food. My emotions and moods have leveled, and I have an energy I never knew existed…one that occurs naturally, not feuled by carbs! I’m not really writing this for your contest, but mostly to tell you that your blog has been a godsend for new sugar- and carb-free eaters like me. I was beginning to accept that I would never be able to enjoy some of my favorite foods again, but your recipes have given me the ability to do that, while still staying within the confines of my diet and without hurting my body. Thank you so much! I don’t know where you find the time to cook and blog like you do, but I pray that you never stop. Check out of the rest of the comments from readers about why they eat sugar-free. I really enjoyed reading all of your stories, and seeing how this way of eating is helping people with so many health issues. Do you crave fresh fruit in this summer heat? I do, and tend to satisfy that desire with stevia-sweetened lemonade instead of “Nature’s Candy.” Some days though, you just gotta indulge in those natural sugars, so here’s how to on your low carb sugar-free lifestyle. Pair the fruit with fat! It dilutes the sugar carbs, making you satisfied with a smaller portion. It also stops your blood sugar from fluctuating wildly and making you hungry an hour after your fruit snack. Besides, fat makes everything tastes better, especially if it comes in the form of organic heavy cream. It’s a divine combination of flavors that inspired countless songs and many different types of desserts. 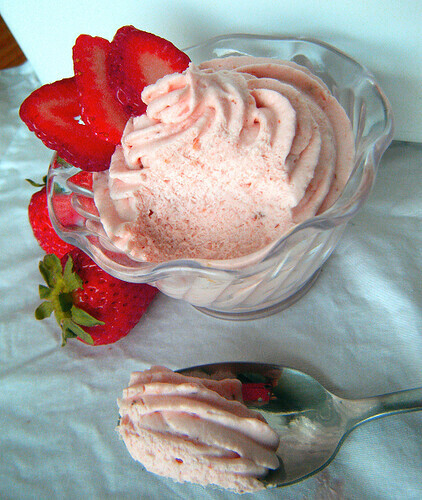 This strawberry mousse will be the first dessert in a series of easy, quick low carb desserts that require minimal effort, yet will still impress that surprise company coming over for dinner! Besides, who wants to make a big mess in a hot kitchen in this weather? This naturally gluten-free, egg-free mousse can also be made dairy-free with the use of full fat coconut milk! It can be made sugar-free using a combination of stevia and powdered erythritol, but any zero calorie sweetener would work well here. I tried this dessert with Splenda as well, because I have decided to include a measurement for it alongside my preferred natural sweeteners from now on. Although I don’t prefer the taste and chemical nature of Splenda for personal use, it is used by so many diabetics and other carb watchers who need to eat a low insulin producing diet to live. Most importantly, there little empirical evidence showing adverse side effects from its use. If by creating an option for sweetening with Splenda in my recipes, I can broaden the appeal of these healthful low carb treats, I am willing to do so. Keep in mind that combining sugar-free sweeteners yields the best taste, and allows you to use less of them overall. Use the sweetening option that works for your lifestyle, beliefs, budgetary constraints, and health concerns. This mousse might work with honey as well, but I didn’t try making it like that since I am attempting to limit consumption of all forms of sugar. I’d start with a 2-3 tablespoons of honey, cooked with the strawberries, if you’d like to go this route. Sprinkle the gelatin over the tablespoon of water in a small bowl, and set aside to soften. Puree the strawberries with the zest, the juice, and the salt. Heat the puree in a saucepan over medium heat, stirring together the strawberries and sweetener just until hot. Add gelatin and stir until melted. Let mixture cool. 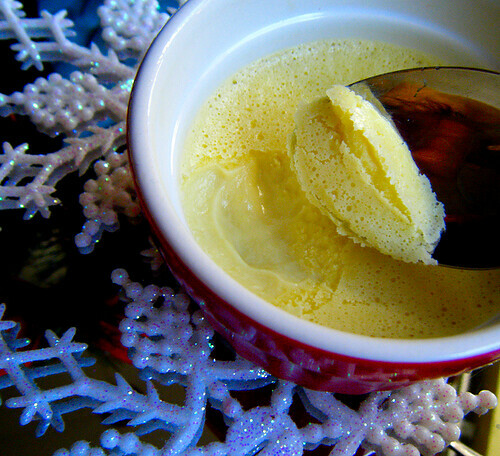 Beat the cream to soft peaks, and beat in vanilla and stevia. Gently fold strawberry mixture into cream. Pour into serving cups and chill for two hours. Place the strawberries, lemon juice, lemon zest, and salt in a saucepan over medium low heat, and add the sweetener (erythritol, Splenda, or honey–don’t add the stevia yet) and water and cook, breaking up with your spatula. Stir around the pan gently until the sweetener has dissolved. Simmer for 10 minutes, or until the strawberries have slightly thickened. Add the gelatin to the pan, and stir until it is completely melted. Puree in a blender (I used my Magic Bullet) or food processor. Let cool to room temperature. Whip the heavy cream to stiff peaks with a hand mixer, and beat in vanilla and stevia. 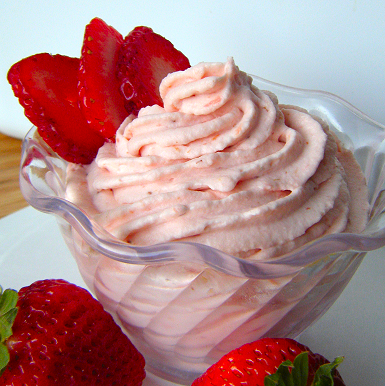 Once the strawberries are cooled, carefully fold the whipped cream into the fruit puree. Pipe mixture into serving bowls, and chill for at least an hour. I used an 8″ Wilton piping bag with the largest tip I could find at Michael’s craft store. The tip was $1.99 and the piping bag was $1.99. First off, take a look at this wonderful profile of Dr. Barry Groves, author of “Natural Health and Weight Loss” and his new release, “Trick and Treat: How Healthy Eating Is Making Us Ill.” Dr. Groves is an advocate of a natural high-fat, low carbohydrate diet for total health and weight management. If you haven’t tried a No-Bake Cheesecake, now is the time. 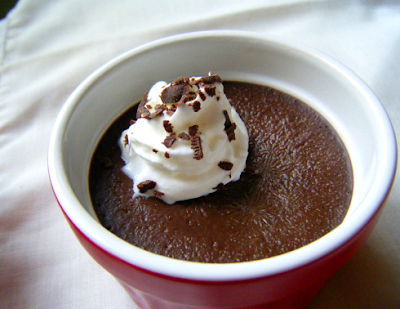 It’s the ideal dessert for a low carbohydrate diet high in nourishing fats. Each silky bite is so creamy, thick, and sweet, you can barely finish a slice of cake, even though it tastes so good that as you’re eating it, you’re sad because you’re getting closer and closer to it being gone! In addition to being a big finish to a meal, I can attest to the fact that this cake is the perfect treat to wake up to if you have a sweet tooth. A breakfast of sugar-free, gluten-free, low carb No-Bake cheesecake will keep you going through the morning, without leaving you feeling stuffed because it is so nutrient dense! We all have heard of the health benefits of pomegranate seeds and juice, which are full of antioxidants and cancer-fighting phytochemicals. This delicious, seasonal fruit is relatively low in sugar, with 26g carbs in a whole pomegranate. Preparation couldn’t be easier. You grind the nuts, bake the crust, and whip together the filling. This is another one of those desserts that will make everyone think you spent hours on it. The pomegranate arils are works of art in their own right. The little red jewels, full of tart, crimson juice, can simply be strewn about the base to make your cheesecake look fit for royalty. 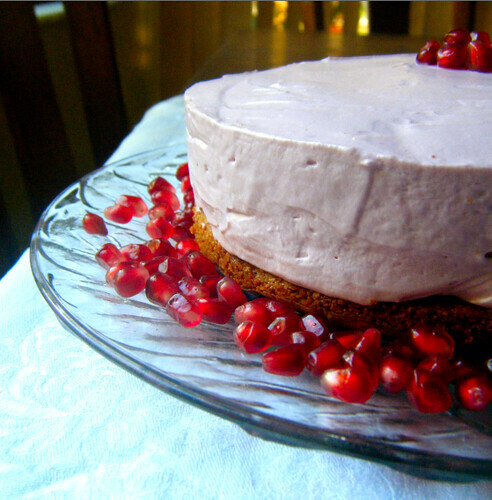 The lovely blush hue of the cheesecake is not 100% derived from the pom juice. You know how I feel about a bit of artifical coloring to jazz up natural desserts. If you don’t like it, don’t use it! Preheat oven to 300 degrees Fahrenheit. Set cream cheese out on counter. Grease a 9” pie dish, or line the bottom of a mini springform pan with a round of parchment paper, and grease the bottom and sides. Grind nuts and oats into a meal in food processor. Add the rest of the crust ingredients, and drizzle in butter. Pulse until a dough forms, then press into the bottom of a pie plate or mini springform pan. Bake crust for 5 minutes at 300 degrees, then turn up the oven to 350 degrees and bake for 15 minutes, or until crust is browned around the edges. Let cool on countertop or freeze for 10 minutes to speed cooling process. Press about 1/2 cup of pomegranate seeds through a sieve to get 3 tablespoons of juice. Save the rest of the juice for glaze. Beat cream cheese for a minute until creamy, and add pomegranate juice, vanilla, stevia, and 1/4 cup erythritol, beating until smooth. Gradually add the rest of the erythritol, and beat for another couple of minutes. Add drops of blue food coloring (about 3) and red food coloring (about 10) until desired shade of pink is reached. In a separate bowl, whip heavy cream to stiff peaks. Fold heavy cream into cream cheese mixture, until most streaks are gone. Spread over crust with a spatula, and smooth the top. Refrigerate for 4 hours or overnight (ideal) and unmold from sides of the springform pan. Store covered in plastic wrap. For glaze, combine all ingredients in a saucepan over medium heat and stir until erythritol dissolves. Whisk in a tiny pinch of xanthan gum and keep stirring, off of the heat, until it thickens. This glaze does not keep, so prepare it immediately before serving. Let sauce cool and pour over individual slices of cake. 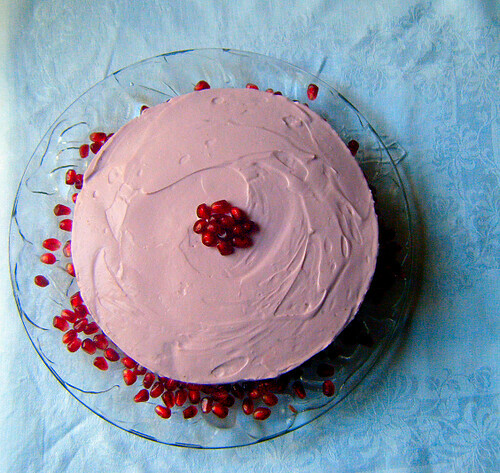 Lemon Variation: Use 2 tablespoons of lemon juice in place of the pomegranate juice. Vanilla Variation: Use 2 teaspoons pure vanilla extract and no fruit juice. I hope everyone had a memorable Christmas, full of healthy goodies and good times with the family! Who else did not feel miserable and overly full after yesterday’s feast? With nourishing food, it’s so much easier to feel satisfied with proper portions! And now… free stuff, yay! I used Raffle King to pick a random commenter. The winner of the erythritol/xylitol sampler is Rachel C.
The two winners of the Lindt and Green & Black’s chocolate packages are Julie and fit lil fiddle. The winner of the Godiva chocolate bar is ikkinlala. Email me your addresses and I’ll get those prizes out within the next couple of days! Thank you to everyone who participated. I love hearing feedback from you all! 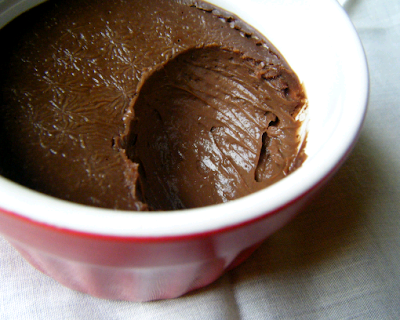 Here’s an easy, delicious tweak to my Pots De Creme recipe for all you dairy-free folks. It’s just as creamy as the chocolate version, but it is less heavy and a bit sweeter. Using erythritol as the sweetener causes a nice crust to be formed on top of the chilled custard, reminiscent of creme bruelee! As for flavor, the almond extract is really good in this, so don’t skip it! The original recipe calls for vanilla beans, so use those if you like. One of these days I’ll get around to ordering some bean pods off of ebay. Using the scrapings of the pod would add pretty dark flecks! Make this impressive dessert for a New Year’s gathering with a few good friends. No one will have any idea that these are low carb, sugar-free, gluten-free treats as they’re cleaning out the ramekin with a spoon. Or hog it all for yourself and have a blissful six pots-de-creme-filled days. They look like so much more work than they are, no? Measure out two cups of coconut milk from the can. If you don’t have enough milk, drop in chunks of coconut oil (or pour in liquid oil) until you have two cups of coconut milk/oil. I had to do this because the can didn’t contain the full two cups of coconut milk. Heat 1 3/4 cup of coconut milk (or coconut milk/oil mixture) over medium low heat. Whisk egg yolks for a minute or two until they are a bit thick. Whisk in sugar, salt, and the reserved 1/4 cup of coconut milk. Stream hot coconut milk into egg yolk mixture very slowly, whisking the whole time. Stir in vanilla and almond extracts. Strain the mixture into a measuring cup if desired (I didn’t do this). 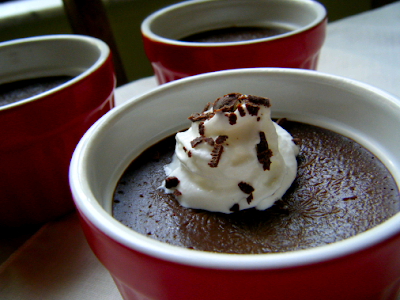 Place six pots de creme cups in a large deep pan. Divide mixture amongst the cups. Pour enough warm water in pan to come up the sides of the cups half way. Cover the pan with foil (I didn’t do this, either). Bake for 45-55 minutes (mine took 50), or until still jiggly in the center but set around the edges. Lay a paper towel over the tops of the serving cups and chill for 2-4 hours until serving. Store individual servings wrapped in a paper towel and plastic wrap. This time of year, I like to cool off with my treats. My new Cuisinart ice cream maker has been running constantly lately. To mix things up and take a break from the brain freeze, I decided to try something new. Cheesecake is the ultimate cool, creamy indulgence that’s naturally low in carbs. There are tons of variations and different recipes out there for this classic dessert. I’ve never made it, though. The idea of using a whole pound of cream cheese, a giant round pan, and a water bath was always intimidating. It just sounds hard, worrying about cracks in the top and achieving the right consistency and whatnot. Though I’ve never experienced intense cravings for this particular food, cheesecake seemed like the perfect excuse to use up a CostCo-sized tub of blueberries sitting in my fruit bin. 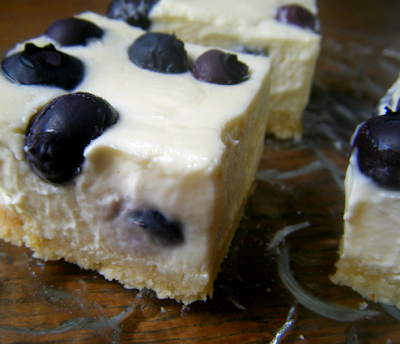 Blueberry cheesecake called my name! 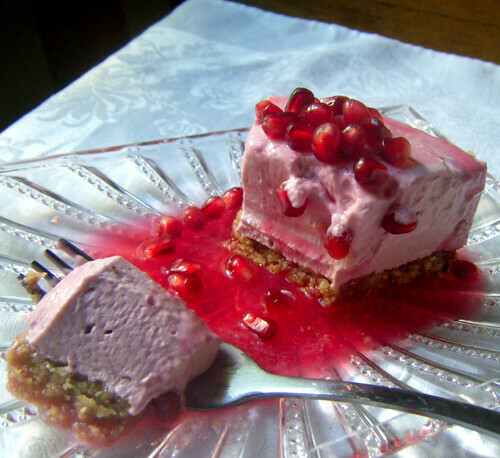 It’s rather simple to de-carb cheescake–you simply remove the sugar. 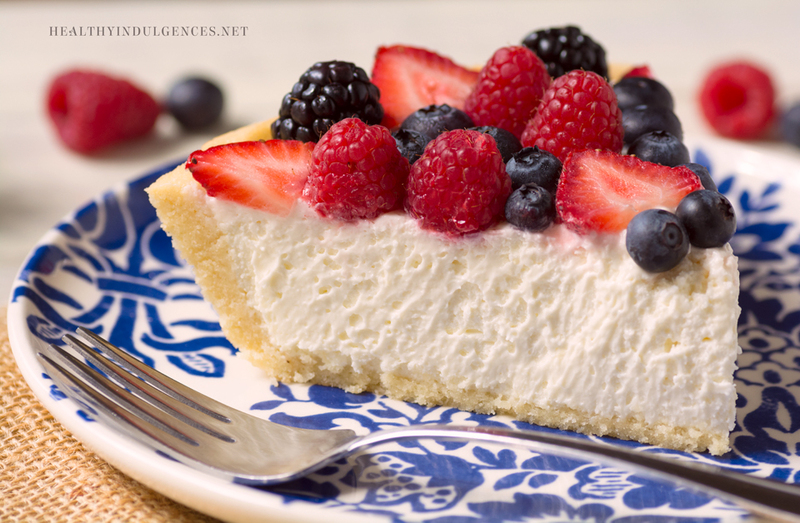 Erythritol (see the bold term for info) works like a charm for “wet” applications like cheesecake, so you don’t have to worry about using any special ingredients to offset its menthol-like “cooling” effect. Stevia rounds out the sweetness of these incredibly creamy bars. 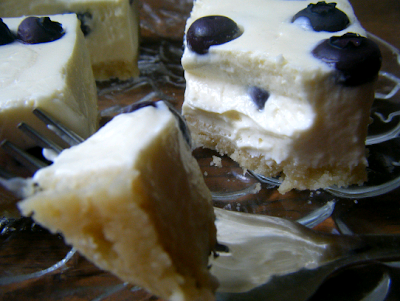 This sour-cream based cheesecake recipe posted in its original form here is a real winner. Thanks to BawdyWench for her simple, delicious recipe! Even if you’re not a “cheesecake person,” you should definitely give this recipe a try. It takes minutes to whip up, and doesn’t have that thick, gummy mouthfeel elicited by a ton of cream cheese. 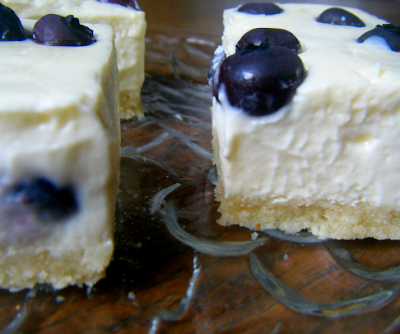 The blueberries burst in your mouth as you bite through the silky base and nontraditional but oh-so-delicious gluten-free shortbread crust (check oats for gf label!). Get your brain-boosting antioxidants in for the day with these fresh blueberries. Studies show that blueberry consumption positively affects your memory. These delicious summer fruits are naturally low in carbs, so eat up! The batch of cheesecake bars from yesterday is almost gone. Some serious nibbling has been happening. I don’t blame the cheesecake bandit–it was love at first bite with these babies! Whisk together dry ingredients for crust. Mix in melted butter and press into the bottom of a foiled lined 8 by 5 loaf pan. Bake for 15 minutes, or until golden brown around the edges. Let crust cool. Turn oven down to 325 degrees Fahrenheit. Blend together eggs, vanilla, sour cream, and sweeteners. Beat cream cheese and melted butter together until smooth, then add to first ingredients and beat until just combined and smooth. Stir in half of the blueberries. 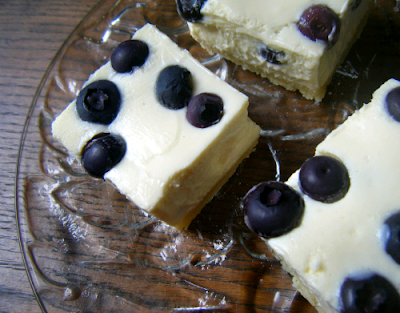 Pour cheesecake batter into loaf pan and sprinkle the rest of the blueberries over the filling. Bake for 35 minutes using the water bath method (see this post). Remove from oven and let the cheesecake bars cool completely, still submerged within the water bath. Remove the loaf pan from the water bath and move it to the refrigerator when the bars have cooled to room temperature. Cover with a layer of paper towels and plastic wrap. Refrigerate for four hours or until firm. Don’t sneak a bite until they have set up properly and attained the perfect creamy consistency! Cuts like a hot knife through buttah!